Edda Rún with the Toppur-trophy. HAMBORG TO THE LANDSMOT – Our 1. price 4gaited mare Hamborg frá Feti did great at the Gaedingakeppni by Sörli in Hafnarfjörður last weekend. 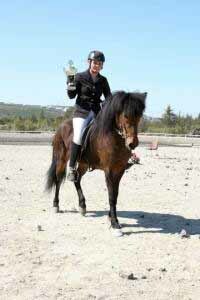 She qualified in third place with 8,45 to the Landsmot in gaedingakeppni 4gait, B-flokkur. This was not her only achievment while she also won the Toppur – trophy wich is given to the highest judged breeding horse of the tournament. Hamborg gerði gott mót í Sörla um liðna helgi. Hún varð í þriðja sæti inn á Landsmót fyrir Sörla í B-flokki gæðinga með 8,45. Knapi var Sigurður V. Matthíasson. Það var ekki eina afrekið Hamborg vann heldur stóð hún sig vel í úrslitum með Eddu Rún Ragnarsdóttur sem knapa og hampaði Toppsbikarnum, sögufrægum farandbikar gefnum til minningar stóðhestsins Topps frá Eyjólfsstöðum og er gefinn hæst dæmda kynbótahrossi mótsins.